If you want to study liberal arts from a Christian perspective and incorporate your faith into your education, consider attending a Christian college. Although the college experience indelibly impacts all students, life on a Christian campus can transform people of faith. For example, daily morning prayer in the school chapel encourages students to commune and worship, and students adhere to a lifestyle reflective of the teachings of Christ. As you pursue your liberal arts degree, you can choose from a diverse selection of majors including chemistry, graphic design, computer science, and Spanish. For those who want to work directly in the ministry or clergy, Bible colleges offer an in-depth study of theology. At Bible schools, students train to become preachers, ministers, or religious workers through curricula emphasizing hands-on experience and missional learning. If you are unsure about dedicating your life to the clergy, affordable Christian colleges serve as a great way to build a foundation in the teachings of Christ before you choose a religious career. With so many affordable Bible colleges, finding the right school may seem daunting. To help you in your search, we have ranked the most affordable Christian colleges across the country. We weigh criteria such as graduation rates, financial aid opportunities, and program offerings to create a list of schools that offer not only a low price tag, but also a valuable education that will guide your career goals. Explore the ranking below to find the Christian college that best aligns with your academic interests. Founded in 1986, HBC offers seminary and church leadership programs rooted in the Baptist tradition. The HBC campus lies at the center of Huntsville, Alabama, the state's third-largest city. The college tailors its programs to working students by offering evening and weekend classes on campus and online. HBC holds accreditation from the Association for Biblical Higher Education. Students at HBC can complete an online AA or BA in Christian education, pastoral ministry, or mission and evangelism. HBC also offers two online associate degrees in child development and business management. Graduate students can complete an online master's in ministry, with an emphasis in either biblical leadership or pastoral studies. Additionally, the college offers an online certificate in biblical studies, and plans to add a master's in African-American studies to its catalog. Students access course content and complete assignments through the Edvance360 platform. All HBC programs emphasize a sense of community in the online learning space, and the school offers multiple resources for distance students, such as peer mentoring and student counseling. The college approaches higher education holistically, and students can join student government groups and a signature book club. Students can also find academic counseling and tutoring through HBC online. To apply, all prospective students must submit academic transcripts and a statement of faith. Undergraduate applicants must also include a letter of recommendation from a pastor or employer, and undergo placement testing. Graduate students must hold a completed bachelor's degree from an accredited college or university, as well as submit to placement testing. Among the state's most affordable online Christian colleges, HBC does not differentiate between in-state and out-of-state tuition rates for undergraduate and graduate students, though online courses do incur an additional fee. Founded in 1951 as Platte Valley Bible College, the school changed its name in 2005 and its location in 2007. The renamed Summit Christian College now sits near the peak of Scotts Bluff National Monument and offers panoramic views of Platte Valley, Nebraska. SCC programs combine sound biblical doctrination and career-oriented training in Christian ministry. SCC holds accreditation from the Association for Biblical Higher Education. Students can earn one of six undergraduate degrees or certificates through Summit Bridge, SCC's distance learning division. Options include an associate in biblical studies, a BS in ministry studies or Christian studies, a BA in biblical studies, and a Christian foundations certificate. Students can complete up to 49% of their total degree credits online; degree seekers must complete the remaining coursework on campus, through directed or independent study, or by using transfer credits. Distance learners complete courses using Zoom, a video-conferencing platform that connects online students from locations across Nebraska, Wyoming, Colorado, and South Dakota. SCC is one of the most affordable online Bible colleges, with the same tuition rates for both in-state and out-of-state students. The school keeps additional costs low, as students avoid pricey meal plans and purchase textbooks for select courses only when absolutely necessary. While the college's overall tuition prices rank among the state's most affordable, students completing courses online can enjoy additional savings over their on-campus counterparts. Applicants must submit academic transcripts and hold a minimum 2.0 GPA. SCC also requires students to submit SAT scores with a minimum of 850 (1250 on the new SAT) or ACT scores with a minimum of 18. Transfer students must complete at least 32 credits toward a bachelor's degree -- or 16 credits toward an associate degree -- at SCC. SCC offers a suite of services for online learners, including a mentored ministry program. This opportunity enables students to shadow a ministry member in their day-to-day environment and learn some of the practical duties they perform. Founded in 1906 by Presbyterian minister Reverend James Forsythe, College of the Ozarks operated as a high school and junior college before it launched four-year degrees in 1965. Today, C of O serves roughly 1,500 undergraduate students on its picturesque campus near Branson, Missouri. The school consistently ranks among the most affordable Christian colleges in the country because of its unique no-tuition policy. C of O holds accreditation from the Higher Learning Commission. C of O does not offer online programs. However, students enrolled in full-time coursework on campus pay no tuition for their college education. Instead, C of O requires students accepted into an academic program to commit to a work-study schedule of 15 hours per week and two 40-hour weeks per year. Dubbed "Hard Work U," the college not only instills a strong work ethic in students, but also enables them to graduate free of student debt. The college offers 25 majors and over 30 minors in liberal arts disciplines, including but not limited to Christian ministry and biblical/theological study. Students may also choose from professional/credentialing programs and certificates in pre-law, pre-medicine, and elementary education. C of O offers students a variety of unique learning and personal support resources, such as engineering tutoring, a foreign language lab, and test-taking strategies and test anxiety counseling. Approximately 90% of accepted applicants to C of O have demonstrated financial need and proof of residency in the Ozarks region across select counties in Arkansas, Missouri, Illinois, Oklahoma, and Kansas. In addition, students must graduate within the top half of their high school class, achieve a minimum 3.0 GPA, and score 20 or 1030 on the ACT or SAT, respectively. The school gives preference to relatives of C of O alumni in good standing, provided the candidates meet all of the above criteria. All students must live on campus during their first year. Established in 1956 as the brainchild of three local ministers, SLCC lies at the "center of evangelism" in St. Louis. The college's first graduating class consisted of 19 students, led by a faculty of only 11 ministers. Today, the private institution enrolls nearly 100 students in undergraduate programs through traditional on-campus, evening, and online coursework. SLCC holds accreditation from the Association for Biblical Higher Education. Available online programs include an associate of arts in religious studies or a bachelor of science in Christian ministry. SLCC also offers an online bachelor's degree completion program in Christian ministry. Distance learners can start the online program in January or July, and typically complete 2-3 eight-week modules per term, with two terms per year. Both traditional and distance learners can access the same database of interstate ministry and job opportunities through the SLCC website. SLCC remains among the most affordable online Christian colleges. The school offers set tuition rates regardless of whether a student is a resident, commuter, or evening learner. Full-time online students and traditional on-campus students also pay the same tuition, though SLCC charges a different rate per credit for part-time enrollment. The college features numerous scholarships tailored to new and returning students pursuing a Christian education. Prospective students receive step-by-step support through the application process from an admissions counselor. In addition to an application, SLCC requires minimum combined or composite SAT and/or ACT scores of 1280 or 18, respectively. New student applicants must also submit high school transcripts -- or a GED equivalent -- demonstrating at least a 2.0 GPA. Transfer students with less than 24 previous college credits must also submit high school transcripts, and may need to submit test scores with their application. Emmaus Bible College takes its name from the small village near where, according to the New Testament, Jesus appeared to two of his disciples after his resurrection. The institution embraces the spirit of the disciples' encounter on that walk by emphasizing transformative growth and service through biblical education. The college began offering evening classes in 1941 in Toronto, Canada, relocated in 1984 to its current location in Dubuque, Iowa, and launched online programs in 2015. The college holds accreditation from the Higher Learning Commission. Students can pursue coursework in a variety of fields, such as biblical studies, behavioral and health sciences, business and technology, education, arts and sciences, and ministry studies. EBC also offers online courses for both degree-seeking and non-degree-seeking students, and dual-credit options for high school seniors. Distance learners complete courses asynchronously using the Schoology platform, and each online course spans either eight or 15 weeks. Among the country's most affordable online Christian colleges, EBC offers distance learners an exclusive rate per credit hour, with an even lower rate for high school students enrolled in a dual-credit program. The college offers scholarships specific to distance learners who are also full-time missionaries. Online learners can access nearly every resource available to their on-campus counterparts, including EBC's library of over 120,000 books and periodicals. The library also links to a consortium that provides access to over 35,000 additional libraries' resources. Online students can also access the school's academic success center and disability services. Applicants must submit official transcripts and cumulative GPA, SAT and/or ACT scores, and a letter of recommendation from a church or academic mentor. Applicants with standardized test scores below the minimum requirement may receive academic assistance admission. Distance students can complete up to 50% of coursework online; however, half of the program requirements must be completed on the Dubuque campus. Founded in 1938 as the Kansas City College and Bible School, KCC now serves nearly 150 undergraduate students at its private suburban campus in Overland Park. The college offers more than 10 traditional degrees and four online programs in unique church leadership fields, such as religion, performance music, and worship leadership. All programs prepare graduates for ministry service. KCC holds accreditation from the Association for Biblical Higher Education. Available online degrees at KCC include an associate or bachelor's degree in either business or leadership and ministry. All programs use a biblical curriculum in a student-focused learning environment. Each online course lasts five weeks, and develops a variety of career, personal, and ministry-specific skills. Associate and bachelor's degrees in leadership and ministry culminate in a capstone or senior portfolio requirement, while business programs require a case study project. One of the most affordable online Christian colleges in the U.S., KCC offers a low rate for online tuition and dedicated financial aid for distance programs. The college also allows students to apply the same discounts toward tuition as on-campus students. KCC honors a church-matching grant program, and discounts are available for members and pastors of the Church of God (Holiness), as well as military service members and veterans. The school also offers some online courses for free or at a reduced rate. To apply for an undergraduate program, prospective students must submit official high school transcripts or a GED equivalent, or proof of an associate degree. Students must also submit references from their pastor, a personal friend/mentor, and an academic/professional. Transfer applicants may apply up to 60 semester hours or 72 quarter credit hours toward a bachelor's degree at KCC. Founded in 1945, Piedmont offers online programs that embrace a three-part mission: obeying the Great Commandment, fulfilling the Great Commission, and living in abundance by the glory of God. Since its inception, students at Piedmont's Winston-Salem campus have represented 83 countries and all 50 United States. Piedmont holds accreditation from the Transnational Association of Christian Colleges and Schools. Students can choose from more than 60 associate, bachelor's, master's, and doctoral programs, with many available online. Distance major and minor options include ministry, children's ministry, nonprofit management, and divinity. Piedmont also offers accelerated bachelor's-to-master's degrees in Christian ministry and biblical studies in a hybrid format. Unique among distance offerings at comparable Christian colleges, Piedmont offers an two doctorates exclusively online: a doctor of ministry and a doctor of leadership. Piedmont features one of the largest selections of institutional scholarships and awards in the Christian college sector. Students can stack many sources of aid, such as federal grants, institutional scholarships, and other external awards, to cover nearly the entire cost of tuition. Piedmont tuition prices differ slightly between part-time and full-time enrollment, but do not differentiate between in-state and out-of-state students. The school also features the Military Apprentice Scholarship, which covers the complete cost of online tuition beyond what a military student receives through tuition assistance. Applicants must submit official high school transcripts (or GED equivalent) with a minimum 2.0 GPA. Students must also submit an ACT score of 17 or higher, or an SAT score of 920 or higher on the new SAT (1230 or higher on the old SAT). Additionally, students must submit a written personal testimony on the topic of their faith. The school also encourages applicants to attend an in-person interview with admissions staff. Established in 1970, Shasta Bible College originated as an extension of the Multnomah School of the Bible in Redding, California. The first courses were held in the evening at North Valley Baptist Church, and by 1982 the school was operating independently and conferring degrees. SBC holds accreditation from the Transnational Association of Christian Colleges and Schools. SBC offers 16 degrees and certificates in Bible studies, theology, and education, and 24 distance education programs in the fields of Christian ministry, education, and Bible study. Online options include an AA in biblical studies or early childhood education, a BA in Christian professional studies, and MA and M.Div. degrees. Non-degree-seeking students may also complete individual SBC courses online. Among the country's most affordable online Christian colleges, SBC does not differentiate between tuition costs for in-state and out-of-state students. All learners pay a set rate per unit for either undergraduate or graduate study, and simply pay an additional housing fee if they reside on campus. SBC offers institutional scholarships and work-study opportunities for students who qualify for federal aid, and honors Cal Grants A and B for qualifying California residents. The school also offers a variety of financial aid opportunities for military students and veterans. SBC requires students to pay a registration and technology fee for each semester in which they sign up for courses; however, the school waives up to $100 of this fee for students who register early. Admissions and course schedules for distance education programs mirror those offered on campus. Courses span 15 weeks each, with an additional week at the end of the course for final exams. Students complete courses asynchronously using the Populi platform, with courses starting in the fall, spring, and summer. Founded in 1855 in Kentucky, Berea College evolved from a one-room schoolhouse to one of the leading liberal arts institutions in the United States. Historically, Berea represents the South's first coeducational and interracial college. Today, the school ranks among the most affordable providers of Christian higher education with its unique tuition promise scholarship program. Berea holds accreditation from the Southern Association of Colleges and Schools. While Berea does not offer online programs, full-time students at the school pay little to no tuition and graduate debt-free. One of only nine Work Colleges federally recognized in the U.S., Berea offers full scholarships -- totaling roughly $100,000 over four years -- for each of its students through an institution-wide work-study agreement. Students accepted into Berea must "earn" their tuition scholarship by taking a position in the labor program while earning their degree. Berea's mission emphasizes a combination of learning, working, and service-based skills. Students may earn a BA or BS in one of 32 major fields of study, including African and African-American studies, nursing, and religion. Extending its outreach programs beyond the school campus, Berea serves the Appalachian community through federally funded service-learning projects. The college also features one of the nation's most extensive collections of historical musical recordings and memorabilia of the Southern Appalachians. Of Berea's 1,600 students, roughly 160 study abroad each year, often with financial assistance from additional travel-specific grants and scholarships. First-year applicants to Berea must submit high school transcripts that show their class rank, SAT and/or ACT scores, an endorsement from a former core-subject instructor, and a completed FAFSA form. Transfer students must submit official transcripts, an essay, an endorsement from a former college professor, and SAT and/or ACT scores if they plan to transfer less than 24 credits. Berea's EDGE program provides first-year students with a free laptop which they may keep after graduation, provided they complete all coursework in good standing. Established as a youth-focused Bible studies institute in the Appalachian Mountains in 1950, ABC today serves nearly 300 college students at a 150-acre campus in Mount Hope, West Virginia. Upholding its motto, "because life is for service," ABC's curriculum aligns with the fundamentalist Christian faith, however the school welcomes students of all denominations. ABC holds accreditation from the Higher Learning Commission and the Association for Biblical Higher Education. In addition to its associate, bachelor's, and master's, and certificates programs administered on campus, ABC offers an online Bible certificate program. The 30-credit certificate encompasses a Bible and theology curriculum that includes coursework in the Old Testament, the New Testament, the Gospel of John, and the Book of Daniel. The program suits students who may be unsure about which vocation to pursue within the church, or who would like to enhance their personal sense of spirituality or understanding of faith. Students may also complete individual courses online in lieu of seeking the Bible certificate. Ranked among the most affordable online Bible colleges, ABC offers tuition prices based on whether a student enrolls in full- or part-time study. Full-time students pay a set rate for a course load between 12 and 19 credit hours, and pay an additional rate for each hour over the maximum of 19 per semester. Part-time students who take less than 12 hours a semester must pay an additional audit fee, but pay a lower per-credit matriculation fee than the set rate required of their on-campus counterparts. Students applying to the online Bible certificate program must submit official transcripts from high school or college-level study, references from a pastor and mentor, and an application and application fee. Non-certificate-seeking students enrolling in select courses of the online program must submit only a pastor's reference with their application and fee. The school's distance learning platform, ABC Connect, offers online courses throughout the fall and spring semesters. Founded in 1921 as the Omaha Bible Institute, today the school prepares future Christian leaders at its sprawling campus in Ankeny, Iowa. The college developed a curriculum for seminary training in 1986, and added six master's degrees, including a master of divinity (M.Div.) program. Faith holds accreditation from the Higher Learning Commission and the Association for Biblical Higher Education. Faith offers six online seminary programs: a doctor of ministry degree, an MA in biblical studies, an MA in practical theology, an MA in religion, an MA in theological studies, and an M.Div. Some distance education programs at Faith require minimal campus visits, allowing students to complete most coursework online. Faith Online also offers individual courses for non-degree-seeking students, dual-credit options for high school learners, and several endorsement programs for K-12, 5-8, and K-8 educators. Students may even earn a bachelor's and master's degree in five years through Faith's FastTrack to Seminary program. The simplicity and transparency of tuition costs at Faith consistently rank the school among the most affordable online Christian colleges in the nation. Faith does not differentiate between in-state and out-of-state students to determine its set tuition rates. Students may qualify for up to seven institutional scholarships to help fund their degree; Faith also offers limited work-study opportunities on campus and helps students pursue gainful employment off-campus with local employers. The college welcomes new students to its biannual scholarship weekends to learn more about completing the FAFSA, what aid options prospective students may be eligible for, and how to stack awards to cover the bulk of tuition costs. A member of the SARA interstate distance education agreement, Faith provides online coursework to students in any SARA-approved state. Students from non-SARA-authorized states should contact the school to request that their state of residence be added to the master list. Established in 1931 three miles from its current site in Jackson, KMBC initially only offered a two-year Bible course. The college eventually expanded its offerings to a three-year Bible program, and by the early 90s, the institution had grown to become an accredited four-year college. KMBC holds accreditation from the Association for Biblical Higher Education. KMBC offers dozens of programs across seven fields of study, including in ministerial studies, Christian ministries, discipleship, and general studies. The school also offers both two- and four-year biblical studies degrees. Students can take numerous courses through KMBC Online; learners can complete these courses individually, as part of a degree at KMBC, or for transfer to another accredited institution. Students take courses asynchronously online, with each lasting either seven or 15 weeks. Students may begin the online program at one of five entry points per year: August, September, October, January, or March. Among the nation's most affordable online Christian colleges, KMBC keeps tuition and fees to a minimum to make earning a degree as accessible as possible. Per KMBC policy, the majority of students' education costs not covered by scholarships and federal aid are financed by generous support from churches, partners, and alumni. The college does not charge different tuition and fees for in-state and out-of-state residents, and it bases its tuition on a 15-credit per semester plan. Most of KMBC's merit-based scholarships apply to both online and on-campus study. Applicants to KMBC must submit high school transcripts, a statement of faith and personal essay about why the applicant chose to pursue KMBC, and two favorable recommendations from a pastor, educator, and/or personal friend. Applicants under the age of 25 must also submit ACT scores. Students submitting a GED instead of traditional high school transcripts will receive provisional admission for the first semester; they may achieve regular admission as early as the second semester, provided they maintain an average of C or above. Located in Bethany, Oklahoma, SCU delivers academic programs from a Pentecostal perspective with an emphasis on spirit, service, and scholarship. Founded in 1946 as a Bible college, SCU gained junior-college status in the 1960s, and received accreditation as a four-year college in the 1970s. Today, the university offers 30 academic programs spanning nine departments and three schools, with some available both on campus and online. SCU offers six bachelor's programs through its Department of Non-Traditional FLEX and Online Education, including a fully online bachelor of professional leadership degree. Students can major in Christian leadership, human services, or business administration with a concentration in management. Distance learners enjoy online test proctoring, expansive online library access, textbooks shipped directly to their door, and virtual advising. Though students complete the majority of coursework online, some programs may require minimal campus visits. SCU remains one of the most affordable online Christian colleges in the nation. Learners studying full time -- or those enrolled in at least 12 credits per semester -- pay a set tuition rate per credit. While the school does not charge different tuition rates for in-state and out-of-state students, online students enjoy a lower flat rate per credit for distance coursework than their on-campus counterparts. SCU offers a variety of institutional scholarships, along with dedicated financial assistance advisers for online students. SCU applicants must submit high school transcripts and SAT and/or ACT scores for admission consideration. Generally, SCU accepts students with an unweighted GPA of at least 2.5 and a ranking in the upper half of their graduating class, and SAT/ACT composite scores of at least 900 or 19, respectively. Applicants who fall short of these requirements may receive probationary or conditional admission to SCU. Established in 1967 in Colorado Springs, NBC is one of 10 Nazarene institutions of higher learning in the nation, and one of the few that prepare ministers in this denomination. Additionally, NBC remains the only school to receive funding and authority through the Church of the Nazarene to deliver multicultural higher education programs in a seminary context. NBC holds accreditation from the Higher Learning Commission and the Association for Biblical Higher Education. NBC offers an AA and a BA in ministry, a ministry preparation certificate, and a non-credit ministerial continuing education program. Students can attend classes either on campus or online; the latter requires learners to complete coursework asynchronously, supported by numerous virtual resources, including a full electronic library and experienced practitioner-instructors. Students enrolled in the AA or BA degree online may also choose from a variety of majors, minors, and concentrations, and can pursue a traditional degree path or a degree-completion program. The ministry preparation certification includes either an elder or deacon track and qualifies graduates for the ordination process. NBC ranks among the country's most affordable Bible colleges, as it offers a variety of institutional scholarships and financial aid programs, as well as support for military service members and veterans. Students enrolled in at least four credits per term (with a minimum 2.0 GPA) can qualify for scholarships, as available according to NBC's annual funds schedule. The college also honors all standard federal programs tailored to active military students and veterans and their families, and offers special assistance and emergency funds to qualifying students. Applicants must submit official high school transcripts or a GED equivalent. NBC does not require an application fee, essay, recommendations, or referrals. Transfer applicants may apply up to 75% of completed credits toward a bachelor's degree at NBC, provided the student earned a grade of C or above. Founded in 1981 in Chandler, Arizona, IBCS first opened its doors to a class of only 15 students. Today, IBCS serves more than 80 college and seminary students through undergraduate programs in ministry and biblical studies. IBCS holds accreditation from the Transnational Association of Christian Colleges and Schools. Distance learners in the school's seminary programs participate in coursework through video conferences. Students can choose an MA in ministry, a master of divinity, or doctor of ministry degree. Distance learners complete coursework through video conferencing and interactive PowerPoint presentations. Though students apply for the distance programs through the seminary headquarters in Chandler, IBCS offers its programs through a partnership with the Tri-City Baptist Church. Learners complete courses using the Blackboard platform. IBCS ranks among the most affordable online Christian colleges for its low, set tuition rates. Students enrolled in a seminary video conferencing program pay the same tuition rate per credit, regardless of their state of residence. The program conducts courses in the fall, winter, spring, and summer terms. The seminary considers each applicant's qualifications holistically; applicants are admitted on a rolling basis, depending on course availability each semester. Applicants to distance learning seminary programs at IBCS must submit official transcripts, a personal testimony of faith, and three references from an educator, employer, pastor, or personal friend/mentor. The school welcomes international students to apply, and requires that they additionally submit ACT/SAT scores and TOEFL test results. Located in Moberly, Missouri, Central Christian College of the Bible opened its doors in the 1950s and continues to focus on Christ-centered education and practical training. The college maintains an affiliation with the Christian Churches and Churches of Christ, offers several ministry-related programs, and enrolls just over 300 students. The school does not hold regional accreditation but does boast national accreditation from the Association for Biblical Higher Education. CCCB provides distance learning programs in Bible-related fields. The school currently offers three online programs: a bachelor of science in the Bible, a bachelor's in religious studies, and an associate degree in biblical studies. CCCB also offers online non-degree certificates in Bible and ministry (16 credits, one semester of full-time study) and biblical knowledge (32 credits, one year). Students looking for a challenge who meet certain requirements can enroll in CCCB's honors program. Each online course at CCCB lasts eight weeks. The school delivers all coursework asynchronously, allowing students to set their own schedules. Students typically spend 15-20 hours per week on their courses, which usually assign about 100 pages of reading per week. Students frequently interact with their professors and peers through discussion boards. CCCB earns its place among the most affordable online Christian Colleges by featuring 100 full-tuition scholarships every year to both first-time and transfer students. The scholarship covers up to 17 credits of courses. Students can renew their scholarships by meeting certain thresholds for grades, chapel attendance, and Christian service requirements. CCCB is also particularly transfer-friendly, as transfer students can earn credits for prior learning, in addition to advanced placement credit. Additionally, transfer students may bring up to 30 approved credits with them. Based in Montgomery, Alabama, Amridge University historically earns acclaim for its programs in Christian counseling and ministry, as well as other seminary-related degrees. The Churches of Christ-affiliated university originally opened its doors in 1967 to serve those purposes. Amridge has since expanded its scope and now offers online programs in business, general studies, and human services, in addition to its traditional slate of theological programs. Additionally, unlike some of the other more affordable online Christian colleges, Amridge boasts regional accreditation from the Southern Association of Colleges and Schools Commission on Colleges. Amridge's slate of online programs includes standout offerings such as a master of business administration, a bachelor's in criminal justice, and a bachelor's in human development. Amridge's school of theology also offers online undergraduate and graduate degrees in New and Old Testament studies, Christian ministry, divinity, and Christian education. Aiming for maximum flexibility regarding working professionals who typically enroll in its online programs, Amridge delivers all online coursework asynchronously through Canvas. In addition to degrees, the school caters to working professionals by offering individual continuing education courses and providing a dedicated career services center to all of its students. Amridge earns its place on this list of affordable, Christ-centered schools thanks to a wide array of scholarships and grants, including options for first-year students, transfer students, home-schooled students, and students who enroll in accelerated programs. Moreover, Amridge operates a laptop program that gives students access to discounted personal computers to enhance their distance learning experience. As a private university, Amridge does not make the distinction between out-of-state and in-state students, and all online students pay the same base tuition, whether or not they live in Alabama. Located just outside of Scranton, Pennsylvania in South Abington Township, Clarks Summit University is a private, Baptist-affiliated Bible college that originally opened its doors in 1932. The university offers a wide range of Bible-focused programs, including associate, bachelor's, certificate, master's, and doctoral degrees. Clarks Summit also provides a dual-enrollment program for high schoolers who want to start earning college credits early. Unlike some of its peers on the affordable online Bible college lists, Clarks Summit boasts regional accreditation from the Middle States Commission on Higher Education. The school also regularly features on lists of the nation's safest campuses. Nevertheless, students need never visit that campus, no matter how safe, to earn a degree or a certificate from Clark's Summit. The school offers online programs at the associate, bachelor's, and master's levels in addition to various programs through Clarks Summit's Baptist Bible Seminary. Standout programs include offerings in business administration, Christian ministries, and counseling ministries, in addition to the Bible and theology. The school's associate programs accept up to 30 transfer credits, while the bachelor's programs accept up to 90. As such, some students can complete programs at various levels in as few as two years. Clarks Summit aims to make online education as accessible as possible, delivering coursework asynchronously and eliminating in-person requirements for most of its programs. In addition, Clarks Summit prides itself on its culture of mentorship and community, ensuring that online students do not feel isolated. The school earns a place among the more affordable online Bible colleges thanks to the various discounts for different types of online students, including military students, Christian workers, and Teens for Christ. Based out of Graceville, Florida, the Baptist College of Florida opened in 1943 as an extension of the Florida Baptist Convention. At the time, the college primarily focused on educating future Baptist ministers to practice in the Sunshine State. The school has since expanded its scope and now offers non-ministry programs in fields such as counseling, music, teaching, and business. Unlike some of its peers on the list of the most affordable online Christian colleges, Baptist College features regional accreditation from the Southern Association of Colleges and Schools Commission on Colleges. Baptist College currently offers all of its degrees and certificate programs online through MyBCF, the college's proprietary learning management system. Keeping in mind that its typical online student also works full time or has significant familial obligations, Baptist College delivers all online coursework asynchronously and eliminates in-person requirements in most of its programs. Standout programs include offerings in Christian studies, music and worship leadership, leadership/Christian education, ministry, and missions. For students who prefer a blended learning approach, Baptist College also operates dedicated distance learning sites out of Jacksonville and Orlando. The school maintains membership in the National Council for State Authorization Reciprocity Agreements, and as such, can offer its online programs in a variety of states. Baptist College earns its place on this list of the most affordable Bible colleges by participating in many federal and state aid programs. Moreover, all students who enroll exclusively in online programs receive tuition discounts when compared with on-campus students. As a private university, Baptist does not differentiate between in-state and out-of-state students, as all online students pay the same base rate, whether or not they reside in the Sunshine State. Based in the eponymous town of Blue Mountain just outside of Tupelo, Mississippi, Blue Mountain College is a private liberal arts school both supported by and affiliated with the Mississippi Baptist Convention. BMC originally opened as a women's college and only recently became fully co-educational in 2005, although the school began accepting men pursuing church-related professions in the 1950s. Mark Perrin Lowrey, the college's founder who served as a general and village preacher, fathered two daughters and believed that educated women could do great things in the post-war, rebuilding South. BMC holds regional accreditation from the Southern Association of Colleges and Schools Commission on Colleges. The college lives up to its motto of "unapologetically Christian" by offering programs in fields such as biblical studies, Christian ministry, Greek, worship leadership, and sport ministry. BMC also offers degrees or minors in unique fields such as coaching, writing, and medical technology. BMC also earns a place among the most affordable online Christian colleges, offering undergraduate programs in psychology, business, and special education, in addition to dual-enrollment courses for high school juniors through distance learning. Aiming for convenience and flexibility, BMC delivers all online coursework asynchronously and eliminates in-person requirements in all of its distance learning. BMC earns its spot among the most affordable Christian-affiliated schools due to its lengthy list of endowed scholarships. The college awards those scholarships in a wide variety of fields, including art, athletics, education, and English. The school also participates in various federal and state financial aid programs. BMC also aims for accessibility with its applicants in mind, running several free preview days and requiring only a 2.0 minimum GPA from each transfer student. Founded in the 1960s by a missionary who graduated from the Moody Bible Institute, Alaska Bible College originally opened with the sole aim of training future ministers to practice throughout the state referred to as "America's Last Frontier." The school maintains this focus and still operates its original campus in Palmer but also expanded its scope over the past few decades, now offering distance learning through extension sites in Glennallen and Anchorage, in addition to both modular and online courses. Every single student at ABC earns a major in the Bible, as the school only offers three programs: a Bible certificate, an associate degree in biblical studies, and a bachelor's degree in Bible and Christian ministry. Students in the bachelor's program can choose an emphasis in children's ministry, student ministry, intercultural ministry, or pastoral studies. In all cases, the program takes four years to complete and requires the standard 120 credits. Students can also opt to take certain courses in these programs online. As a smaller school, ABC prefers a more intimate experience and delivers all online coursework synchronously. In the interest of convenience, these online courses do not include on-campus requirements. 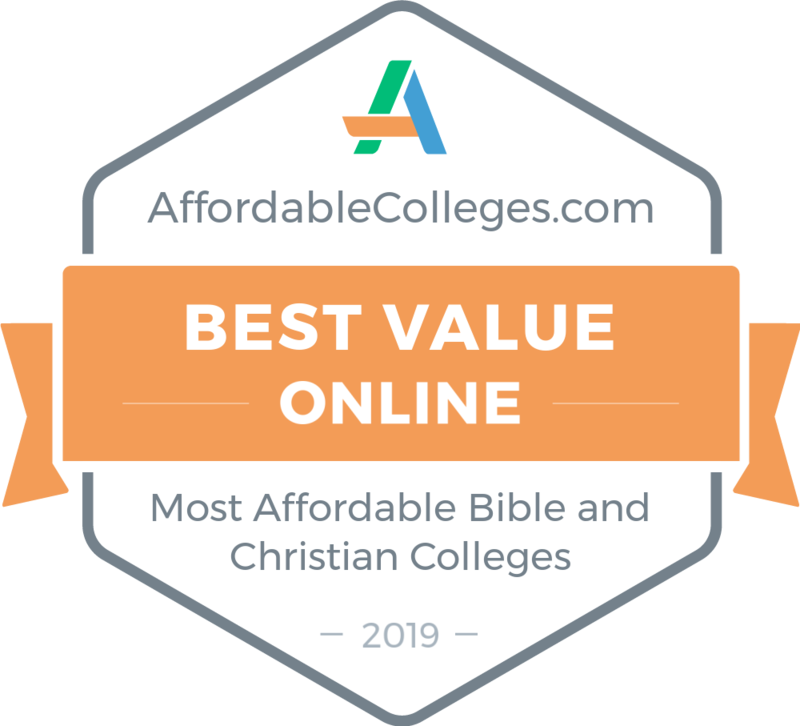 ABC earns a spot among the most affordable online Christian colleges thanks to its cheap, flat-rate tuition and its yearly, semester, and monthly payment plan options. Part-time and dual-enrollment students may pay per-credit tuition instead of the flat rate. The school participates in several federal and state financial aid and scholarship programs, including certain tribal grants and scholarships. ABC also features scholarships, including a northern ministry scholarship for students intending to practice ministry with Native Americans in Alaska. Based out of Searcy, Arkansas, Harding University is a private college named after the Churches of Christ minister James A. Harding. The university maintains an affiliation with the Churches of Christ to this day and primarily focuses on undergraduate and graduate programs in the liberal arts. Harding also offers pre-professional degrees and various Christ-centered programs through its school of theology, based in Memphis, Tennessee. Harding benefits from more resources than many of its peers among the most affordable online Christian colleges, as the university currently holds the distinction of the largest private college in Arkansas. Harding also benefits from a global reach, offering plentiful opportunities for study abroad and mission trips to its students. Harding operates multiple departments dedicated to online education, including the Center for Adult and Online Studies and the Center for Distance Education in Bible and Ministry. Those two centers make up the bulk of the school's distance learning presence. As such, Harding primarily focuses on distance-learning programs for working professionals and ministry-type degrees. Standout online programs at Harding include a bachelor's degree in Bible and ministry, a master of ministry degree, and a bachelor's degree in either management or marketing. As many of Harding's online students continue to work or raise families full time, the university delivers the majority of its online coursework asynchronously and generally eliminates on-campus requirements in its distance learning programs. Harding strives to make its education affordable for all, awarding over $22 million through its scholarships and approximately $9 million through grants and scholarships each year. As a private university, Harding does not distinguish between in-state and out-of-state students, so all online students pay the same base rate. Veritas Baptist College originally opened in Fredericksburg, Virginia in 1984 as the brainchild of three local pastors. Originally known as Berean Baptist Institute, the school only offered a single graduate degree in theology, catering exclusively to students who wanted to commit full time to Christian ministry. The school boasts a long history of working professional-friendly programs, as all of the initial cohorts worked full time and classes took place during weekday evenings. In modern times, VBC continues to uphold its tradition of education for working professionals by only offering online degrees. Nevertheless, the school also expanded its scope in recent years and now features undergraduate degrees, graduate degrees, and dual-enrollment options for high schoolers interested in the ministry. Standout programs include degrees in ministry, Christian education, divinity, and biblical studies. VBC also awards 12-credit graduate certificate in fields such as pastoral leadership, biblical counseling, theology, and missions. All of these programs deliver their coursework asynchronously through Populi, VBC's online learning management system. In the interest of convenience and flexibility, the college also eliminates all on-campus and in-person requirements in each program. Though VBC does not hold regional accreditation, the college boasts national accreditation from the Transnational Association of Christian Colleges and Schools. The college also earns a place among the most affordable online Christian colleges, providing several military education benefits, awarding various grants, loans, and scholarships, and maintaining an affordable flat tuition rate for all full-time students regardless of location. To that end, as a private college, VBC does not differentiate between Virginia residents and out-of-state students when assessing tuition. Located just off of the Atlantic Ocean in Deerfield Beach, Florida, South Florida Bible College and Theological Seminary is a relatively young school, opening its doors in 1985 by the pastor of the Christian Love Fellowship. The school has seen rapid growth in the past few years, as enrollment jumped from around 75 students in 2014 to more than 400 as of December 2018. SFBC owes that growth in large part to an expansion of its programs. The college now features associate, bachelor's, master's, and doctoral degrees in fields such as biblical studies, Christian business management, Christian counseling, ministry and leadership, divinity, and pastoral counseling. The school also earns a place among the most affordable online Christian colleges by offering all of its programs online, except for the doctorate in ministry. SFBC caters to its online students by providing personalized assistance (e.g., prayer support) and academic advising each semester. As many of SFBC's online students continue to work full time or raise families, the school's online programs deliver coursework asynchronously and never require students to visit campus, picturesque as Deerfield Beach and nearby Boca Raton may be. While SFBC does not hold regional accreditation, it boasts national accreditation from The Association for Biblical Higher Education. SFBC earns a place among the most affordable online Christian colleges through its cheap per-credit tuition rate and elimination of out-of-state tuition for both on-campus and online students. The school also participates in several federal and state financial aid programs that can help ease the burden of tuition. Additionally, SFBC provides several benefits and discounts to military members and their families. Created primarily with the goal of serving working professionals, Carolina College of Biblical Studies maintains a diverse student body with a nearly equal amount of men and women who possess a variety of different Christian faith and ethnic backgrounds. The college operates its central campus in Fayetteville, North Carolina but also offers many of its programs online or at extension sites in Concord and Monroe. Originally opening as the Cape Fear School of Theology, the college took on its current name in 2012. CCBS focuses on close interaction between student and faculty members, working to maintain a ratio of 15-to-1. The online department at CCBS currently offers three degrees: bachelor's programs in advanced theological studies, biblical studies, and leadership and ministry. In each program, students take one course at a time, with each course lasting five weeks. Each student participates in a cohort, progressing through the same course material with the same group of peers. Recognizing that many of its online students work full time, CCBS delivers all online coursework asynchronously and eliminates all in-person and on-campus requirements in its online programs. In all three programs, students receive a week's worth of assignments due at the same time each week. Though Carolina College of Biblical Studies does not currently hold regional accreditation, it does hold programmatic and national accreditation from the Association for Biblical Higher Education. CCBS earns a place among the most affordable online Christian colleges through a cheap per-credit tuition rate and several benefits for military students, in addition to several financial aid and scholarship opportunities. CCBS awards three scholarships, including two focusing on ministry students. Heritage Christian University, a private Bible school based out of Florence, Alabama, maintains an affiliation with the Churches of Christ. The college celebrated its 50th birthday in 2018. Throughout its existence, HCU changed names many times, as the school was previously known as Southeastern Bible Institute and International Bible College before settling on Heritage Christian University. In modern times, HCU focuses on delivering Christ-centered programs both in-person and online. HCU currently offers the following online programs: an associate degree in biblical studies, a bachelor's degree in biblical studies, a master of ministry, and a master of arts program in which students read, discuss, and interpret biblical texts in their original languages. In most of these programs, HCU digitally records each course lecture and posts them all online in a learning management system. HCU also provides supplemental materials online, such as notes, slideshows, and readings. As such, students can complete their programs through asynchronous coursework without ever needing to visit campus or complete any in-person requirements. In addition to featuring convenient online programs, HCU stands out by earning a place among the most affordable online Christian colleges. Beyond providing a wide variety of financial aid options, HCU focuses on developing financial literacy in its students. To that end, HCU provides each of its students with access to Cash Course, a free, online financial literacy training program. Aside from financial literacy, HCU also focuses on awarding scholarships to its students in lieu of loans. The school's Legacy Scholarship program offers Pell Grant recipients tuition waivers, allowing them to take their first paces down the path to ministry. Moreover, HCU offers and acknowledges many scholarships, both through the school itself and third parties. Located in Pineville, Kentucky, Clear Creek Baptist Bible College is a private Bible school that maintains an affiliation with the Kentucky Baptist Convention. In years past, CCBBC went through several iterations, including Clear Creek Baptist School, Clear Creek Mountain Springs, Inc., and Clear Creek Mountain Preacher School. Unlike some of the other most affordable online Christian colleges, CCBBC holds both regional accreditation from the Southern Association of Colleges and Schools Commission on Colleges and national accreditation from the Association for Biblical Higher Education. CCBBC houses five unique, Bible-focused programs: a bachelor of arts in ministry, a 3+1 program for future church planters, a certificate in the Bible, an associate of arts in ministry, and a bi-vocational ministry certificate. The ministry bachelor's program earns the most renown nationwide, as it covers the entire Bible over the course of 32 credits. The bachelor's in ministry program is also the only program that CCBBC offers online. Fortunately for working professionals and students with significant familial obligations, CCBBC delivers all coursework in this program asynchronously and does not include in-person or on-campus requirements. CCBBC earns a place among the most affordable colleges of its kind by offering both a cheap, flat-rate tuition for full-time students and an affordable, per-credit tuition rate for part-time and online students. The college also offers several scholarships through its endowment, including regional scholarships, church scholarships, and scholarships named for certain benefactors. The school also provides financial aid primarily through work-study opportunities, which CCBBC awards on a first-come, first-served basis. Formerly known as Grace Bible College, this particular school rebranded to Grace Christian University in 2018. Located in Grand Rapids, Michigan, Grace maintains an affiliation with the evangelical Grace Gospel Fellowship. The university's roots stretch back to an evening Bible school in Milwaukee, Wisconsin that aimed to train the next generation of Sunday school teachers in the 1930s and 1940s. The school moved to its current location in the 1960s. Since then, Grace has expanded to offer majors in fields beyond ministry and Christian education, including programs in fields as far-reaching as exercise science and aviation. The modern version of Grace excels in distance learning. Grace offers both undergraduate and graduate programs online, asynchronously, and without any on-campus or in-person requirements. Standout online programs include offerings in human services, criminal justice, leadership and ministry, psychology, and organizational leadership. The school also features programs in unique fields such as pastoral ministry, music, women's and youth ministry, and urban studies. Grace prides itself on its 4+1 programs, which allow students to earn both a bachelor's degree and a master's degree in five years. On-campus students can benefit from Grace's study abroad opportunities, which include trips to Belize, Ireland, Turkey, Italy, Puerto Rico, and Israel. Grace earns a spot among the most affordable online Christian colleges thanks to the robust financial aid packages that the school provides specifically for online students. The Grace Online Community Partnership Scholarship provides a 20% tuition grant to students who work for one of the university's partner companies. Additionally, Grace is particularly military-friendly, offering military tuition discounts and assistance. Based in the mountains just outside of Johnson City, Tennessee, Milligan College historically serves the population in and around the Volunteer State's Tri-Cities. The college consistently earns nationwide acclaim for its strong, Christ-centered and liberal arts-based curriculum, including a core humanities program that all Milligan students must complete. During the humanities program, students grapple with significant, often faith-related questions that deal with God, spirituality, and humanity. Milligan's strength also extends beyond the humanities, as the school currently offers more than 100 different majors. Despite its regional college roots, Milligan expanded its distance learning programs in recent years and now boasts the capacity for online learners around the country. The college created its first online program in 2009 and has focused on expanding its distance learning capabilities ever since. Milligan's department of graduate and professional studies serves as the primary overseer of distance learning at the college, ensuring that all of Milligan's online programs include a distinct focus on working professionals. Given that focus, Milligan delivers all online coursework asynchronously and eliminates in-person and on-campus requirements in its distance learning courses. Online offerings at Milligan include graduate MBA degrees in leadership, health sector management, and operations management; master's programs in curriculum and teaching and information systems; a bachelor's in business administration; and various ministry-focused programs (divinity, ministry, and Christian ministries) through Milligan's Emmanuel Christian Seminary. Milligan earns a spot on the list of the most affordable online Christian colleges because of its significant financial aid awards, as well as its numerous grants and merit-based scholarships. As a private college, Milligan does not distinguish between Tennessee residents and out-of-state students, and all online students pay the same base tuition. Based out of Johnson City, New York on the site of a former amusement park, Davis College is a private Bible college that maintains affiliation with the Baptist Convention of New York and holds an official endorsement from the Baptist Convention of Pennsylvania/South Jersey. The evangelist John Adelbert Davis founded the school with his name and in the image of Moody Bible Institute, which he attended. Unlike some peers among the most affordable online Christian colleges, Davis holds both regional accreditation from the Middle States Commission on Higher Education and national accreditation from the Association for Biblical Higher Education. In modern times, Davis features programs on campus, online, and at teaching sites throughout New York, Ohio, and Maryland. The school particularly excels at online education. Davis offers online courses in a wide variety of departments each semester, including psychology, mathematics, religion, spiritual formation, and history. The school's online courses primarily cater to working professionals returning to school after long layoffs. To better fit the needs of these professionals, Davis delivers all online coursework asynchronously and eliminates on-campus and in-person requirements wherever possible. Nevertheless, Davis also prides itself on a personal touch in online education, as online students still frequently receive the opportunity to interact with their professors one-on-one. As a private college, Davis charges out-of-state online students the same rate as residents of the Empire State. Furthermore, 87% of students at Davis receive a scholarship or grant, while 98% receive some type of financial aid. Davis also awards The Practical Plan (four years of studies for the price of three years of tuition) to some students who do not meet eligibility for other scholarships. Based out of Grand Rapids, Michigan, Kuyper College primarily focuses on preparing the next generation of Christian leaders and ministers in the Great Lake State. The college grounds its teachings in a Reformed worldview, as the school originally featured the name Reformed Bible Institute, changing it in 2006 to honor Abraham Kuyper, a Dutch theologist and prime minister. Kuyper also focuses on personalized interaction among students and faculty, as its enrollment never rises above 300. The college holds national accreditation from the Association for Biblical Higher Education and regional accreditation from the Higher Learning Commission. The school has significantly evolved since its RBI days and now offers programs in non-ministry fields, such as information technology, nursing, and business. Nevertheless, the Reformed worldview influences all of the school's teachings, even those that are not overtly religious. Kuyper also currently offers its master of ministry program through online learning. The program's 36-credit curriculum prepares graduates to confront any theological or job-related challenges they may encounter in the ministry and primarily delivers coursework synchronously through video conferencing, occasionally blending with some required on-campus coursework. Kuyper also garners recognition as one of the most affordable online Christian colleges. The college's loan repayment assistance program helps low-income students with paying back any loans they take out to attend Kuyper. The college also participates in several federal and state financial aid programs to award numerous scholarships and grants based on incoming students' SAT scores and GPAs, with a 3.85 GPA and a 1310 SAT score qualifying for the top-tier scholarship. Located on Lake Marquette near Bemidji, Minnesota, Oak Hills Christian College started in 1925 as a camp and training facility. Today, with a student-faculty ratio of 14:1, the interdenominational school provides a personal and biblically centered education to its graduates. Oak Hills offers three completely online degrees, including an associate degree in biblical studies and ministry, a bachelor's degree in leadership and ministry, and a bachelor's in business administration and management. Because of the school's strong emphasis on ministry, even students pursuing their online bachelor's degree must take several courses centering on biblical studies and ministry. Online students pursue courses in completely asynchronous format and enjoy the flexibility of course sessions structured frequently throughout the year. Oak Hills strives to be transfer-friendly with generous transfer policies, and it offers credit for prior learning. To date, both in-state and out-of-state students pay just $390 in tuition per credit, which averages to $11,700 for 30 credits per year (not including costs for books). Oak Hills Christian College offers federal, state, and institutional grants, as well as church match scholarships. The campus library operates in conjunction with Bemidji State University Library, expanding the resources available to students. Some students also enjoy participating in the school's study tour to Israel. Oak Hills Christian College is accredited by the Commission on Accreditation of the Association for Biblical Higher Education. Founded in 1901 with the main campus just minutes from downtown Nashville, Trevecca Nazarene University currently serves nearly 4,000 students through its campus-based and online degrees, as well as specialist and certificate programs. Trevecca designs its programs with a Christian worldview in mind. Committed to the proposition that learning happens best in a community, Trevecca offers its eight undergraduate and nine graduate online degrees in a cohort model. This template encourages students to move through the program together, cultivating the kind of network interactions that promote learning and professional growth. Fully online degrees at Trevecca do not require on-campus visits. Students move through the courses in an asynchronous manner, enhancing both flexibility and the opportunity to focus. Many degrees also offer accelerated pacing. Regardless of their major, all students take one or more courses centering on a biblical perspective. Virtually all of Trevecca's students receive some form of financial aid. What's more, in-state and out-of-state students at Trevecca pay the same cost for tuition, which ranges from $275-$799 per credit. Trevecca Nazarene University also offers financing advantages for military students, and it participates in the Yellow Ribbon Program. Incoming high school seniors need a high school GPA of at least 2.50 and an ACT composite score or 18 or a restructured SAT total score of 960. Trevecca Nazarene University is accredited by the Southern Association of Colleges and Schools Commission on Colleges. In 2013, Central Florida Bible College in Kissimmee, Florida, merged with Johnson University to form Johnson University Florida. Adhering to the school's motto, "strong in the Scriptures," all degrees and coursework emphasize a Christian perspective. Offering more than a dozen online degrees, Johnson University Florida strives to make its programs affordable with tuition ranging from $400-$600 per credit. Out-of-state students pay the same rate as in-state students. Relative to the total cost of attendance, Johnson University Florida students typically procure "far less education-related debt upon graduation than the national average." Johnson University Florida's online delivery format, Sakai, promotes communication, collaboration, and community-building. It also lends itself well to research and group projects. Online students enjoy the benefits of the school's Academic Support Center as well as excellent library support. While distance learners often miss the benefits of on-campus chapel services and related meetings, Johnson University Florida's online students can watch live-stream coverage of chapel services. Courses transpire in short terms (six per year) to accommodate an accelerated pace. In addition to standard admission protocols, applicants to Johnson University Florida must complete and sign a Commitment to the Johnson Lifestyle and write a short essay explaining their Christian commitment, desire to attend the school, and recent church involvement. Two letters of reference are also required: one from a pastor and one from an employer or educator. The school prefers ACT scores of at least 18. Johnson University is accredited by the Southern Association of Colleges and Schools Commission on Colleges. Started by Dwight Moody in 1886 as the Chicago Evangelization Society, the Moody Bible Institute has remained true to its mission to train Christian ministers in all walks of life. The school focuses on treating ministry and career as a single focus. Based in Chicago, Moody Bible Institute also operates the Moody Theological School in Michigan and an aviation school in Spokane, Washington, to support missionary outreaches. Of special interest to online students, Moody Bible Institute pioneered distance education by offering courses through the mail in 1901 for "those of both sexes who cannot, for financial or other reasons, attend the Institute personally." Now offering an array of ministry-related degrees and certificates online, Moody has developed a track record for building students through the convenience of the online format. Online students at Moody can select from the eight-week term delivery format or the more relaxed 16-week courses; both formats offer the same content. Courses intend to forge strong links between the student and his or her family, work, and church. New online students participate in Moody's online mentoring program, which allows them to meet other students in the cohort. The school offers a generous transfer credit policy which can reduce a degree's total cost. Tuition ranges from $340-$430 regardless of one's state of residence, making Moody an affordable online Bible college indeed. Contact the school's financial aid office for assistance with grants and scholarships. The Moody Bible Institute is accredited by the Higher Learning Commission of the North Central Association of Colleges and Schools. It also holds accreditation from the Association for Biblical Higher Education as well as the Commission on Accrediting of the Association of Theological Schools. Started in 1848 and named for Geneva, Switzerland, Geneva College currently serves more than 1,400 undergraduate students from its campus in Beaver Falls, Pennsylvania. Founded by the Reformed Presbyterian Church of North America, Geneva emphasizes the Christian faith in every academic, athletic, and student activity. The school's core curriculum centers on the Bible, foundations of Christian thought, and a Christian understanding of life. An impressive 96% of Geneva grads either secure jobs or enter graduate school within one year after they earn their degree. Geneva offers fully online bachelor's and master's degrees, as well as an associate degree. Some online bachelor's degrees take as few as 16 months to complete if students commit to the accelerated format. Most students at Geneva receive financial aid. As one of the more affordable Christian colleges, Geneva sets tuition for undergraduate online adult programs at $399 per credit (rates for master's programs vary by major). Rates remain the same for in-state and out-of-state students. Those who served in the military should confer with the financial aid office for special funding. While applicants must have earned a 2.00 GPA for admission, be aware that incoming freshman averaged a GPA of 3.60, an ACT score of 24, and an SAT score of 1080. Applicants with less than a 2.00 GPA will need to submit a writing assignment. Geneva is regionally accredited by the Middle States Association of Colleges and Schools, and by the Council for Christian Colleges and Universities. Many individual programs hold programmatic accreditation. Founded in 1930 as the North Central Bible Institute, North Central University serves students from its campus in Minneapolis, Minnesota. Owned and operated by Assemblies of God, the school pursues academic excellence with a commitment to biblical and Pentecostal foundations. Serving more than 1,000 students with a classroom ratio of 17:1, NCU maintains a strong, personal connection with its students. Online students may listen to live broadcasts of the daily chapel service. North Central University offers a handful of online degrees: an associate in church leadership, a bachelor's in business administration, a bachelor's in church leadership, a bachelor's in digital media, and a master's in strategic leadership. Through the school's 4+1 program, some undergraduate programs allow students to apply credit toward the master's so they may earn their degree in one year. Considered one of the most affordable online Christian colleges, NCU charges $510 per master's degree credit (amounting to $15,000 for the master of arts in strategic leadership). With 100% of the students receiving financial aid, NCU partners well with students to reduce debt load. Undergraduate students at NCU must hold a 2.2 GPA from high school and have scored at least an 18 on the ACT. Graduate students must have earned at least a 3.0 in the bachelor's degree. Those who did not achieve a 3.0 must submit an academic essay or a GRE or GMAT score above the 50th percentile. North Central University is regionally accredited by the Higher Learning Commission. New Orleans Baptist Theological Seminary operates as the first theological institution created by the Southern Baptist Convention. Located on a former almond orchard, the school has trained more than 20,000 men and women for ministry. In an effort to extend ministry training to those whose occupations and life situations do not lend themselves well to campus-based study, NOBTS offers several online programs at the undergraduate, graduate, and certificate levels. Students may pursue their degree through the standard asynchronous format. However, those students preferring a more direct connection to professors and other students may opt for either the NOLA2U or the NOLA2U-Flex options, which involves listening to live or recorded lectures. As one of the most affordable online Christian colleges, NOBTS charges $260-$270 per credit for Southern Baptists and another $125 per credit for students not affiliated with a Southern Baptist church. The school also requires additional amounts for online tuition and registration fees. The seminary evaluates applicants' GPA and GRE scores on a sliding scale. Those holding a GPA of at least 3.26 for an undergraduate bachelor's degree suffer no point deduction. Students must also score at least a 500 on the GRE verbal and 4.0 on the writing sections. The sliding scale suggests a competitive application process. New Orleans Baptist Theological Seminary is regionally accredited by the Southern Association of Colleges and Schools Commission on Colleges. Graduate-level theology degrees are accredited by the Commission on Accrediting of the Association of Theological Schools. Originally Kansas Bible College, Manhattan Christian College started in 1927 near Kansas State University in Manhattan, Kansas. Founded by the concept that every Christian is a minister, MCC structures its courses and degrees to expand a student's sense of mission and equip him or her to fulfill that mission. This commitment leads to an educational focus that prepares students for ministry in all contexts, not just paid pastoral positions. Through its distance education department, MCC offers online courses for a bachelor's degree in biblical leadership and a bachelor's in management and ethics. All three-credit courses meet for eight weeks. Distance education students may take up to two courses at a time. Students transferring in from another school should consider the college's reasonable credit transfer policies. All online students at Manhattan Christian College can access its library website. Other academic support services include academic counselling and writing resources. All degree-seeking students must pay a one-time $300 fee to purchase Logos Bible Software. Given the number of resources packaged within this software, the expense represents considerable savings for the student. An affordable online Bible college, MCC provides a tuition break for online students. In-state and out-of-state residents pay the same. The school's website also offers a helpful financial aid planning page, featuring plenty of institutional scholarships and grants. Manhattan Christian College is regionally accredited by the Higher Learning Commission and the Association for Biblical Higher Education. Founded in 1859 by the Churches of Christ, Freed-Hardeman University serves more than 1,900 students (from 33 states and 20 foreign countries) from its main campus in Henderson, Tennessee. Since FHU strives to build strong Christian thinkers in all sectors of society, all undergraduate students complete a liberal arts core that includes biblical studies. Chapel services help students maintain this focus; online students can watch services live every Monday. FHU offers several online master's degrees in divinity, ministry, New Testament, Old Testament, curriculum instruction, special education, business administration, and business administration in healthcare management. Four- and eight-week sessions allow for accelerated completion. For example, FHU's online master's in business administration can be completed in one year. Tuition at FHU ranges in cost for full- and part-time students and for undergraduate and graduate students. Students with a military background may benefit from Freed-Hardeman's collaboration with the U.S. Department of Veterans Affairs in the Yellow Ribbon Program. This post-9/11 GI Bill program offers a generous tuition reduction. For convenience, students may pay interest-free monthly tuition payments through the Tuition Management System. This feature supports online students who continue to work while pursuing their degree. To apply to FHU, graduate-level students must have earned at least a 3.0 GPA in a previous baccalaureate program; they must also write a personal essay describing how an education at Freed-Hardeman will relate to their future goals. As well, applicants must submit three letters of recommendation: one from a pastor, a teacher, and an employer. Undergraduates may find handy this step-by-step guide to FHU's admissions process. Freed-Hardeman is regionally accredited by the Commission on Colleges of the Southern Association of Colleges and Schools. Founded in 1910 as the Baptist University of Oklahoma, Oklahoma Baptist University serves as a small Christian liberal arts university in the town of Shawnee, Oklahoma. OBU offers bachelor's degrees in 88 areas of study; it also offers master's degrees, certificate programs, and an English program designed for international students. Regardless of one's field of study, a biblical foundation abides. OBU offers master's degrees in nursing, business, marriage and family therapy, intercultural studies, and Christian studies, some of which may be earned online. For example, the MBA's courses are offered online or on campus in the evenings; students may finish this degree in fewer than two years or, if desired, at a slower pace. As one of the most affordable online Christian colleges, OBU claims its "net price is 37% percent less than the national average." Tuition varies by programs, and scholarships are available. What's more, financial aid counselors are "at the ready" to work with students to create suitable financial packages. Undergraduate applicants to OBU must have earned a high school GPA of at least 3.0 and rank in the top half of their high school class. Furthermore, the applicant must have earned at least a 20 on the ACT and a 1030 on the new SAT. Applicants may earn up to 32 semester hours via credit by examination. Oklahoma Baptist University is regionally accredited by the Higher Learning Commission of the North Central Association of Colleges and Schools. Some programs are accredited by the Association of Collegiate Business Schools and Programs, and the Commission on Collegiate Nursing Education. Located on a 60-acre campus in Joplin, Missouri, Ozark Christian College started in 1942 with the mission of training men and women for Christian service in vocational or bi-vocational ministry. Operated by the Independent Christian Churches and Churches of Christ, OCC requires all students to take 50 Bible courses. Ozark Christian College offers one fully online degree, the bachelor of arts in biblical studies. Designed to meet the ministry training needs of working adult students, this degree allows students to take courses in eight-week terms, five terms per year. Full-time students take two classes (6 credits) per module. OCC charges the same tuition to in-state and out-of-state students, which makes it more affordable than a public four-year institution. While students in the online degree can receive full federal financial aid, they cannot apply for OCC's institutional or memorial scholarships at this time. Ozark Christian College bases its admission requirements on a combination of one's high school GPA and scores on either the ACT or SAT. OCC also accepts results from the Classic Learning Test. While enrolled at OCC, students must maintain at least a 2.0 GPA; those who have earned a scholarship or grant must maintain a 2.5 GPA in order to renew the aid. Ozark Christian College has been granted regional accreditation candidate status with the Higher Learning Commission and is on track for full accreditation status. Additionally, OCC is nationally accredited by the Commission on Accreditation of the Association for Biblical Higher Education. Founded in 1886 by the Arkansas Baptist Convention, Ouachita Baptist University is located in Arkadelphia, Arkansas. The liberal arts school serves about 1,500 students from 30 states and 30 foreign countries, almost all of whom live on campus. Despite its small size, the Southern Baptist-affiliated OBU offers dozens of degrees and programs of study. In response to the growing number of adult students returning to college studies, OBU offers a handful of online degrees: an AA in Christian studies and three bachelor's degrees. Students take fully online courses in five eight-week terms throughout the year. Pace of study can easily fit a student's family and work schedule. For those unfamiliar with online learning, OBU created an orientation course (1 credit hour) to introduce students to its learning management system, other online students, proper time management, and campus resources. For students nearing graduation, OBU offers resume and interview preparation. One of the most affordable online Christian colleges, Ouachita Baptist University charges online students $325 per credit (course-related software may be required). OBU's financial aid office evaluates all applicants for eligibility for institutional aid, grants, and scholarships. Apply early, and submit your FAFSA early for best selection. Ouachita Baptist University is regionally accredited by the Higher Learning Commission. The school's business administration, teacher education, music education, and dietetic education programs hold programmatic accreditation. From its campus in Portland, Oregon, Multnomah University equips its students to love Christ and serve neighbors. The school's educational approach -- to stress ministry in all life contexts -- prepares students for effective service in any field of study. Started by John Mitchell in 1936 as Multnomah School of the Bible, Multnomah continues to expand and revise its approach in pursuit of its original mission. This expanded approach led Multnomah to adopt university status in 2008. At Multnomah University, online students may select from several bachelor's and master's degrees. In addition to the foundational Bible and theology degree, students may pursue a bachelor's degree in psychology, business management, healthcare management, or information technology. Non-seminary master's degrees include global development and justice, Teaching English to Speakers of Other Languages (TESOL), or management and leadership. Seminary degrees include three master's of arts and a master of divinity. Multnomah works hard to develop community for its online students by integrating them into cohorts and through video-conferencing and chat. Multnomah University's website offers plenty of well-organized information for financial aid. Online students pay tuition fees ranging from $465-$550 per credit (plus a $130 technology fee per semester). Review the tuition and financial aid webpage for planning suggestions. Multnomah University is regionally accredited by the Northwest Commission on Colleges and Universities. The seminary holds additional accreditation from the Commission on Accrediting of the Association of Theological Schools. Established as a women's college in 1846 by the Methodist Episcopal Church, Taylor University honors Bishop William Taylor in both name and mission. Located in Upland, Indiana, TU stays true to its original mission of challenging each generation of students to integrate faith and learning while following Christ's example. Committed to establishing a true community of believers in pursuit of common missions, all students must review and agree to the Life Together Covenant. Taylor University offers more than 100 self-paced online courses that can be used toward a degree. The school also offers completely online associate degrees in biblical studies, human services, and professional writing, as well as a professional writing certificate. For students wanting to teach in the Indiana public education system, TU offers a graduate-level Transition to Teaching program. Most online students at TU attend part-time, taking two to three courses at once, on a semester basis. The school offers helpful library resources and interlibrary loan so students may access global libraries at no extra cost. Similarly, students may access the Ringenberg Archives, a repository of information generated by Taylor's staff and students. All students (and staff) must indicate a profession of faith in Christ as a non-negotiable commitment to enrollment. Online course tuition for programs at TU range from $400-$450 per credit hour, considerably less than fees for campus-based programs. Taylor University is regionally accredited by the Higher Learning Commission. The school also holds programmatic accreditation from the Council for the Accreditation of Educator Preparation, and the Accreditation Council for Business Schools and Programs. Reflecting its growth in breadth and depth of course and degree offerings, Bethel College - Indiana just began the process of changing its name to Bethel University. Located in Mishawaka, Indiana, Bethel College - Indiana started in 1947 under the direction of the Missionary Church. Bethel College - Indiana offers more than 50 undergraduate and graduate degrees. Online options for undergraduates and graduates continue to grow. Students can take online courses year-round in six seven-week terms. For instance, with its accelerated one-year option, the school's RN to BSN completion program generally takes the shortest amount of time to complete; the master of arts in counseling takes the longest (2-3 years). As an affordable online Christian college, Bethel's tuition fees range by program and level. Many mid-career online students take advantage of the monthly installment plan available through Tuition Management Systems. This option makes it easier for those keeping current employment while pursuing their online degree. Admission standards vary by program, especially graduate degrees. Bethel offers a generous transfer credit policy that allows undergraduate students to transfer any coursework in which the student earned a "C" or better. That said, a student's remaining 30 hours must be completed at Bethel. Bethel College - Indiana is regionally accredited by the Higher Learning Commission. Programmatic accreditations include the National Council for Accreditation of Teacher Education and the Accreditation Commission for Education in Nursing. Based in the mountains of North Carolina just outside of Asheville in the eponymous city of Montreat, Montreat College is a private, interdenominational Christian liberal arts school. The college traces its roots back to the turn of the 20th century, when several ministers congregated in Montreat to open the Mountain Retreat Association, now known as the Montreat Conference Center. The college now holds regional accreditation from the Southern Association of Colleges and Schools Commission on Colleges. In modern times, Montreat counts itself among the leaders in education for working professionals. The college's School of Adult and Graduate Studies enrolls many students each year at satellite centers in Charlotte, Morganton, and Asheville. Many of the students in this program also complete their degrees online. Montreat currently offers seven online bachelor's degrees (business, Bible, cybersecurity, human resources, management, marketing, and psychology); three online associate degrees (business, cybersecurity, and general studies); three master's degrees (mental health counseling, management, and business); and one certificate in cybersecurity. As all of the students in these programs work or raise their families full time, Montreat delivers all online coursework asynchronously and eliminates in-person and on-campus requirements in each of these programs. Montreat also earns renown as one of the most affordable online Christian colleges thanks to its affordable per-credit tuition rate and numerous military student benefits. Since Montreat is a private college, out-of-state online students pay the same tuition as North Carolina residents. The school also honors several aid sources for working professionals, including Pell Grants and North Carolina Need-Based Scholarships. With a commitment to advancing a Bible-based education, Hobe Sound Bible College started in 1960 on the property of the Sea Breeze Camp near Hobe Sound, Florida. In keeping with the ministry commitments of the Wesleyan tradition, all students must complete Christian service work while pursuing their degrees. Hobe Sound Bible College offers several online associate and bachelor's degrees. Bachelor's degrees can be earned in general Christian studies, ministerial studies, education, and counseling. Students can pursue an associate degree in Bible, ministerial studies, counseling, or intercultural studies. Striving to provide an affordable online Bible college education, Hobe Sound Bible College charges $200 per credit (plus a technology fee of $30 per course). Hobe Sound Bible College also supports students through various financial aid options. For transferring students, Hobe Sound Bible College requires at least a "C" earned in any course. Students must also maintain at least a 2.0 GPA to remain in good standing. Students must complete their final 30 hours at Hobe Sound Bible College. The school also offers life experience credits for those with considerable ministry-related experience after high school graduation (note: the amount of credits one can obtain through life experience is limited). Hobe Sound Bible College is accredited by the Association for Biblical Higher Education. The school also holds membership in the Association of Christian Schools International. Rooted in the fundamentalist Baptist tradition, Maranatha features numerous academic offerings and a strong influence in the local faith community in Watertown, Wisconsin. The school serves more than 1,400 students from 48 U.S. states and 18 international locales. Maranatha receives regional accreditation through the Higher Learning Commission. Maranatha offers 14 online associate, bachelor's, and master's degrees and certificate programs. The school offers undergraduate majors, including Bible and Christian ministry, along with broader liberal arts and practical subjects like humanities, interdisciplinary studies, and business. Graduate students can pursue an online master's program in organizational leadership or a master of education with a concentration in teaching and learning. They can also attend the Maranatha Baptist Seminary, with degree options including Bible and biblical counselling. Maranatha offers online courses and programs to high school and military students through bridge and dual-enrollment options. Students complete the majority of their online coursework asynchronously, though some professors require occasional synchronous sessions. Maranatha remains one of the nation's most affordable online Bible colleges due to the generosity of patrons, including alumni and Church partners. Personal advisers help incoming freshmen pursue financial aid, institutional scholarships, and a payment plan option, which enables students to pay one-third of the tuition costs per semester up front. Undergraduate applicants can apply online through the Marantha portal. Prospective students must include documentation of their educational background and any relevant military training or service, testify to their personal Christian experience, and agree to behavioral expectations while attending Marantha. Graduate students must also detail their educational experience and agree to Maranatha's behavioral expectations. Students may start courses in the fall, spring, or summer term. Established in 1950 in Wake Forest, North Carolina, SBC now offers programs with a global focus that emphasize international missions and Christian education. Students can pursue academic degrees and certificates across nine innovative fields of study, including international missions, church planting, and womens ministry. SBC holds accreditation from the Southern Association of Colleges and Schools Commission on Colleges and the Commission on Accrediting of The Association of Theological Schools. SBC offers five fully online degrees: a master of divinity (M.Div. ), an MA in Christian studies, an MA in intercultural studies, an MA in church planting, and an MA in Christian ministry. Students can also choose from 11 free courses offered online at SBC. The M.Div. degree features five fully online concentrations, including an advanced M.Div., Christian ministry, missiology, North American church planting, and preaching and pastoral ministry. Distance learners may choose to complete courses through hybrid delivery, in which they attend some courses on campus to supplement their online study. Students can also complete core requirements through SBC's extension centers in Florida, Virginia, South Carolina, and North Carolina. Among the most affordable online Christian colleges, SBC offers tuition rates well below the national standard. Distance learners and traditional students at SBC pay the same set rate for courses, regardless of their state residency status. Additionally, the school offers a variety of unique institutional scholarships, such as financial and academic support for minority and nontraditional students through the Missions Initiative and the Society for Women in Scholarship. Students may apply for financial aid at the same time as their general application in the fall, spring, winter, or summer term. Undergraduate applicants must submit official transcripts, a completed Southeastern Covenant, a character reference, a pastor reference, and a church recommendation for admission consideration. Though requirements may vary for online students, applicants may also need to submit a complete immunization history and medical form. Married students must also submit a personal statement from their spouse. All applicants must submit to a criminal background check. The most affordable online Christian colleges offer the flexibility many learners desire. Asynchronous courses allow students to attend class at any time while still enjoying close connections with faculty and classmates. Most programs provide web-based forums to facilitate peers discussions, group activities, and faculty advisement. In addition, online learning can prove especially convenient if you plan to work and raise a family while enrolled in school. Since you can attend class from your own home, you can save the costs of on-campus room and board. Furthermore, enrollment in affordable online Bible colleges provides students an opportunity to participate in local ministry and apply their education in a real-world setting. Ideally, the decision to enroll in an online program means you are focused, organized, and self-directed. You must also feel comfortable accessing online resources like reference materials and university services like career counseling, tutoring, and library assistance. Bible and Christian colleges both reflect a strong commitment to Christian beliefs as evidenced by their mission. Nevertheless, these two types of schools differ in the kinds of students they attract, the courses they provide, and the professional paths their graduates pursue. Bible colleges aim to prepare learners to enter careers in the ministry. Graduates of these schools often undertake professions such as pastors or Christian counselors. Given their commitment to the ministry, those entering this career field should understand biblical concepts; listen to their constituents without judgment; and generally behave with patience, ethics, and selflessness. Just like any other four-year liberal arts school, Christian colleges prepare students for the career of their choice. Christian colleges and other colleges differ in their focus: the former ensures graduates develop a Christ-like character and deepen their faith through coursework that integrates biblical principles into the instruction. What’s more, learners enrolled in Christian colleges should demonstrate a devotion to God and lead a prayerful life. They may also give back to society through volunteerism and attend church regularly. The following sections highlight careers and potential salaries for Bible college graduates. These occupations attract those who complete their degree at affordable online Bible colleges rather than Christian colleges. Earning a degree from a Christian college prepares you for virtually any career, but a Bible college specifically develops students for ministerial occupations. The professions and salary you can expect as a Christian college graduate mirror those of a liberal arts college graduate, so the information below offers insights for Bible college students. Your annual income as a ministerial professional depends on several factors, including the experience you possess. Most professionals earn more over time as they develop additional skills, and the same holds true for Bible college graduates. The following table highlights yearly salary by career choice and level of experience: entry-level, mid-career, and experienced. The table also shows the overall median salary for each role. Your coursework deepens your understanding of the Bible so that you can help others do the same. A degree from an affordable online Bible college prepares you for careers that leverage your knowledge, skills, and faith. Moreover, a willingness to offer biblical guidance and counsel to those in need — coupled with your own commitment to Christian principles — mean you can pursue the following occupations or others similar to them. This professional oversees a Christian church congregation in teaching, prayer, and spiritual leadership. Since a pastor develops and delivers worship services, they should possess strong writing and speaking skills. These responsibilities also require a deep understanding of biblical principles and history. In addition, a pastor conducts funerals, weddings, and other services. The responsibilities of this role include overseeing programming for children and youth. These duties can entail developing nursery protocols, creating curriculum for children and youth services, and supervising volunteers. A ministry director may also oversee staff and church events. They should enjoy working with children and youth, and communicate well with parents and other adults. A private school teacher develops classroom curriculum and instructs students to build their knowledge in a subject area. Regardless of the subject area, they must also assess students’ knowledge through assignments, tests, and projects. In addition, a private school teacher must provide one-on-one assistance to learners and communicate children’s performance to their parents. This professional guides couples, families, and individuals who face challenges so they can identify and problem-solve those issues. Counselors pray with patients and draw parallels between a patient’s circumstances and biblical principles. In addition, they connect people to resources and document their treatment of them. Joining a professional organization broadens your understanding of your chosen career field in that it connects you to other like-minded colleagues. Your membership generally affords continuing education opportunities through conferences, workshops, and symposia in addition to networking gatherings. You not only learn from other experts, but you also share your knowledge. You can also access the job boards within these professional organizations. Association of Certified Biblical Counselors This organization generally counts pastors and disciple-makers among its members. It offers certification for Bible counselors to verify that their practice aligns with biblical doctrine and offers assistance to help test-takers prepare for the examination. In addition, the association hosts a range of regional and national conferences. Catholic Biblical Association of America Founded in 1936, this organization’s members encourage the scholarly review of scripture from a faith-based perspective. Joining this association offers access to meetings, resources that support biblical and Christian research, and various publications like the Catholic Biblical Quarterly. The organization also offers scholarships for doctoral students. Society of Biblical Literature This organization traces its establishment to 1880, from which time it promoted the academic examination of the Bible. With members including students and scholars, members of the general public may also join with limited privileges. The society collaborates with educational institutions to support biblical scholarship, and it also develops resources for diverse audiences. United Methodist Women An inclusive organization, United Methodist Women develops the leadership capabilities of women as they grow spiritually. Members execute projects in the U.S. and abroad through missions that address social justice and humanitarian issues, and they advocate for government policy to protect people’s rights globally. They also participate in Bible studies and retreats. Institute for Biblical Research A scholarly organization, this association’s members include Old and New Testament experts who want to promote an understanding of the Bible in a faith-oriented environment. Joining provides access to seminars, workshops, research, publications, and an annual conference. The organization also posts open jobs and hosts special events for women scholars.